BIG BROWN (USA) (Bay 2005-Stud 2009). 7 wins-1 at 2, Kentucky Derby, Gr.1. Sire of 430 rnrs, 255 wnrs, 20 SW, inc. Dortmund (Los Alamitos Futurity, Gr.1), Coach Inge, Darwin, Dawnie Perfect, Nancy, Big Wildcat, Neverland, Eminencia, Lovable Lyss, Manhattan Dan, Nicky's Brown Miss, Red Sashay, Kiss to Remember, Mighty Brown, Reno Rebel, Bella Castani, Brown Almighty, Elegant Bel, Ground Transport, Shades of Sugar, SP Adore, Military Angel, etc. Home on a Wing (g. by Hawk Wing). 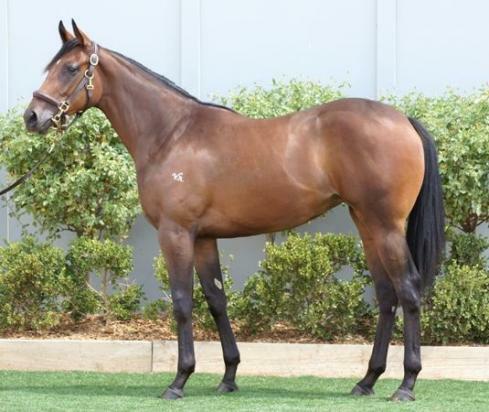 2 wins at 1800m, 2000m, A$169,770, ATC Stylecraft H., 2d Newcastle Gold Cup, Gr.3, ATC Miller H., STC NGS Super H., 3d ATC Pride of Accountability H., Buy Your Next Racehorse at Inglis H., STC Rosehill Gardens Event Centre H.
Turbo Street (g. by Encosta de Lago). 4 wins at 1600m, 1700m, A$100,035, to 2015-16, MVRC Ranvet H., 2d SAJC Port Adelaide Guineas, L, Spud Lite H., 3d VRC Gippsland Region H., SAJC Mac Just Over? Don't Drive 2YO H., Peter Elberg Funerals H.
Hard Marker (g. by Fastnet Rock). 5 wins to 1500m, A$94,950, 4th ATC Pago Pago S., Gr.2. Swiggin' (g. by Fastnet Rock). 4 wins at 1300m, 1400m to 2015-16 in Aust. Karosse (g. by Flying Spur). 3 wins at 1200m, 1400m in Aust. Golden Organic. Winner at 2 in 2015-16, ATC Hyland Race Colours 2YO H., 2d ATC Tab.com.au 2YO P.
OUTBACK PRINCE (Desert Prince). 4 wins-3 at 2-from 1200m to 1600m, A$841,350, QTC TJ Smith Classic, Gr.1, AJC Hobartville S., Gr.2, Ksar 2YO H., STC Jack Daniel's 2YO H., 2d AJC Spring Champion S., Gr.1, Leger 2YO H., STC Bondi Junction 2YO H., 3d AJC George Main S., Gr.1, STC Rosehill Guineas, Gr.1, Theo Marks S., Gr.2, Gloaming S., Gr.2, 4th STC BMW S., Gr.1, NSW Tatt's RC Ming Dynasty H., Gr.3. Sire. HOTEL GRAND (Grand Lodge). 3 wins at 1600m, 2000m, A$598,860, AJC Spring Champion S., Gr.1, Canterbury Guineas, Gr.1, Newcastle JC Spring S., Gr.3, 2d AJC Dulcify H., L, 4th STC Hobartville S., Gr.2. Sire. Extra Terrestial. 2 wins. See above. Star Search. Winner at 1300m, AJC Electro H., 3d STC Centurian Float H.
Captain Daylight. Winner at 1200m, 2d AJC Mounties H., STC Kogarah RSL Club H., 3d AJC Narwee H., STC Blondies Hair Stylists H., Adco Constructions H., Stacks the Law Firm H.
Track Flash. 4 wins at 1200m, 1300m in 2015-16 in Aust. Miss Husson (Husson). 6 wins from 1200m to 2000m, A$160,450, BRC Andrew Bensley No 1 in News H., Yellowglen P., Ipswich TC GCTC Melbourne Cup Packages H., Sky Racing P., SCTC Bruce McLachlan Memorial H., 2d Sunshine Coast Guineas, Gr.3, 3d Ipswich TC Sirromet Winery H., SCTC 7 Sunshine Coast Local News H.
Emvepee. 2 wins at 1400m in 2015-16 in Aust. Express Flyer. 4 wins to 1350m, STC Truscott's Toyota H., 2d AJC Diamond Jubilee H., STC Boasting H., St Finbar's Seniors Group H.
Terrestial. 2 wins. See above. Blind Offer. 4 wins from 1600m to 2050m, A$83,830, SAJC Sims Metal H., VRC Grass Valley H., 2d MRC Daniel O'Brien H., Lowland H., VRC Rainburst H., 3d MRC John Payne H.
DRIVEN TO TEARS (Luthier). 3 wins at 1850m, 2100m, Longchamp Prix des Gravilliers, L, Saint-Cloud Prix de Cluny, L, 2d L'Omnium de Longchamp, L, Longchamp Prix Salverte, L.
SMART JAUNE (Smarten). 9 wins, US$324,261, Laurel Humphrey S Finney S., L, Pimlico Cedar Key H., L.
AWFULLY SMART (Anees). 8 wins-1 at 2-from 1m to 9f, US$494,305, Delaware Park Leonard Richards S., Gr.3, Stymie S., L, 3d Delaware Park RRM Carpenter Jr Memorial H., L, Brandywine S., L.
ACADEMIC (Henny Hughes). Champion 3YO Filly in Canada in 2015. 4 wins from 1m to 9f, US$519,545, Northlands Park Canadian Derby, Gr.3, Hastings Park British Columbia Derby, Gr.3, Woodbine Oaks, L, 2d Woodbine Maple Leaf S., Gr.3. AWESOME FIRE (Strong Contender). 3 wins-2 at 2-from 7f to 1¼m, US$329,495, Woodbine Wonder Where S., L, 3d Woodbine Oaks, L.
SECRET WISH (Street Cry). 2 wins-1 at 2-at 8½f, Woodbine Algoma S., L, Allowance.